It features easy playlist edition, CD-ripping, MP3 Walkman support, audio CD burning and Internet radio playback. Its interface is strongly based on Apple's iTunes. It also includes such features as playlist support, iPod integration, podcast playback, and support for streaming audio. 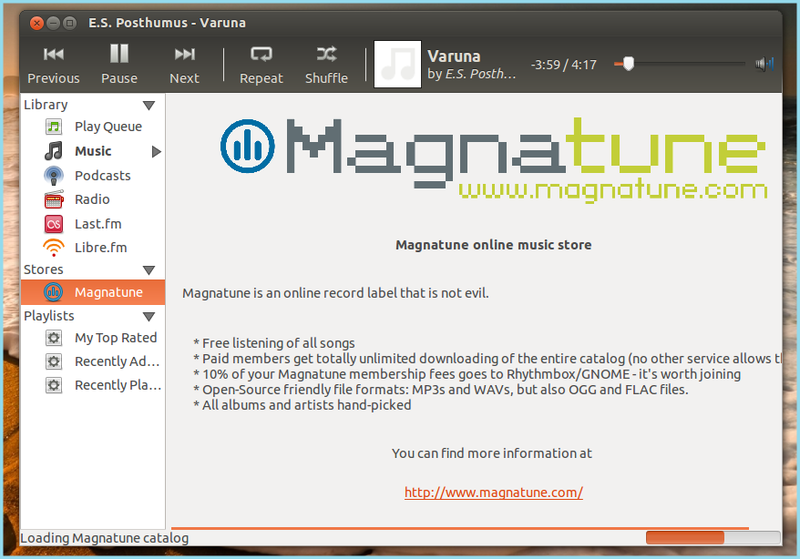 It even goes as far as to allow users to browse the online music stores Magnatune and Jamendo. Some of the key features that come with Rhythmbox are an easy to use music browser, searching and sorting music, comprehensive audio format support through GStreamer and manual and automatic Playlists creation. 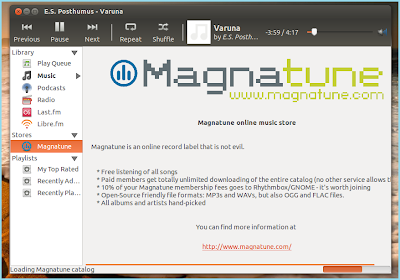 Rhythmbox also features Internet Radio support, including Last.fm streams, automatic download of audio podcasts and the ability to browse, preview, and download albums from Magnatune and Jamendo as previously mentioned. Some of the more basic features of Rhythmbox include displaying audio visualizations, displaying album art and song lyrics downloaded from the Internet and the ability to play, rip, and burn audio CDs. Probably the most useful key feature is the ability to transfer music to and from an iPod, MTP, and USB Mass Storage music player. Written in general C programming, the latest version of Rhythmbox on the market is version 2.99.1. Rhythmbox has been extensively integrated with several external programs, services and devices. 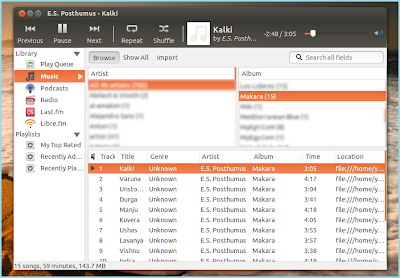 One such external source is Ubuntu, where it is featured as the default media player instead of its competitor, Banshee, for version 12.04 LTS. It is also featured as an extension for Mozilla Firefox and as a plugin for Creative Commons. As for Rhythmbox’s Party mode, Party mode sets Rhythmbox to cover the desktop/panels on full screen and queues any selected tracks in the play queue automatically. 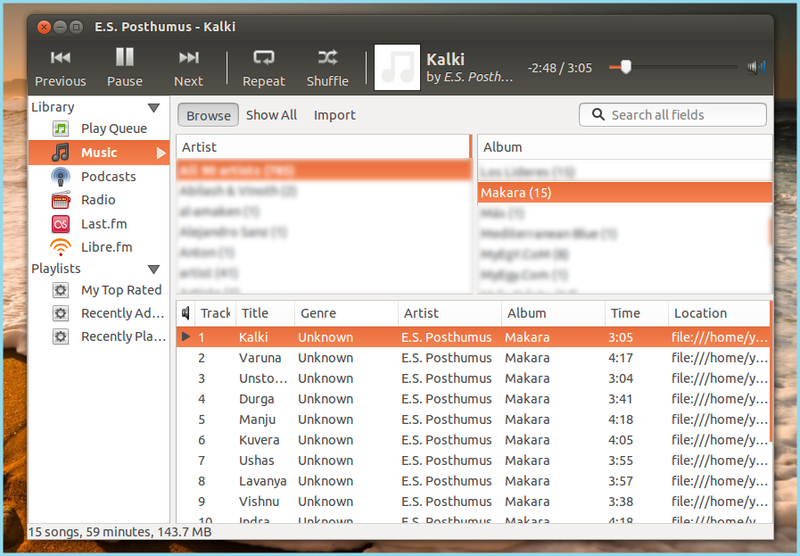 Rhythmbox features a unique “music browser”, which allows users to search for music that they love in a simple and easy to use format. Coupled with the unique feature of creating “automatic playlists”, which allows the user to create playlists that automatically include or exclude songs from the Library based on a user-defined set of criteria, Rhythmbox has set a new standard for what it means to be a “music player”. On top of these two unique features, Rhythmbox’s added ability to browse and download albums from online sites such as Jamendo and Magnatune make Rhythmbox truly a unique and exceptionally user-friendly music program. With all these features integrated into this unique piece of music software, Rhythmbox is this writer’s choice for music friendly entertainment. Sara Collins is a writer for NerdWallet, a site that helps tech-lovers learn about a range of personal finance topics, from coupon codes to college tuition planning.